Translated and introduced by Ian Seed, out now on Wakefield Press. Originally published in French in 1917 but ignored (though subsequently a collector’s item after the end of WWI), The Thief of Talant would not see a new edition until 1967, after the author’s death. To this day it remains a particularly enigmatic book in the poet’s œuvre. Challenged by his friend, poet and art critic Max Jacob, to write a novel, Pierre Reverdy produced this strangely titled experiment: a fragmented assemblage of loneliness, paranoia, and depersonalization drawn from his own experience of Paris in the early twentieth century, the sometimes antagonistic atmosphere of the avant-garde, and his own troubled relationship with the generous but frequently suspicious Max Jacob, who like many of his literary and artistic friends, detected the threat of his literary treasures getting plagiarized among everyone he knew. 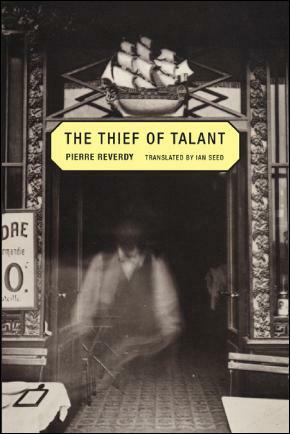 Toward the end of his life, Reverdy confirmed that the alienated and anxious “thief” of this novel in verse was a portrait of himself (“Talant” conveys both the dual echo in French of “talent” and the small town of “Talan” near Dijon, thereby evoking a potential plagiarizer from the countryside, finding his way in the Paris of the years 1910–1917), and “Abel the Magus” a semi-satirical portrait of Max Jacob. The Thief of Talant was and remains a radical experiment in verse and narrative, but it is also a hauntingly beautiful and moving evocation of the loss (and recovery) of self, and an encrypted guidebook to the “heroic” years of Cubism and that movement’s literary and artistic protagonists.